Let me preface this by saying I am and have always been a die-hard Yankees fan my entire life. I root for them day in and day out, so I am definitely a Yankees fan. That intricate, little 3-letter word though is very interesting; fan. There are many different kinds of fans. I am cut from a different cloth from the majority of fans. I am able to remove myself from the ignorance that most fans blind themselves with. Let me start with the facts regarding Robinson Cano and his departure from The New York Yankees. The Yankees were only willing to offer him a 7 year, $175 million contract. Yeah….ONLY $175 million right? I say only because the contract Cano ended up accepting, as most of you already know, was the 10 year, $240 million deal offered to him by The Seattle Mariners. Here is where most fans get confused and make themselves look stupid (very stupid). Sports is Robinson Cano’s profession. Sports is a business to Robinson Cano (and many others around the world). Some athletes care about a combination of winning and money, while others care only about the latter. To that I say, ummmm okay. Robinson Cano along with every other professional athlete in the world has the right to choose the higher contract if they want to, even if it means he is leaving everyone’s precious Yankees. He can go and play wherever he wants for however much he wants and it won’t and shouldn’t effect me in any way shape or form. I understand the attachment that people have with their teams, but everyone needs to get off their high horse and stop acting like they would stay with the Yankees and sacrifice $65 Million!! Robinson Cano’s choice was simple to understand. He cares less about having the chance to win a World Series (or even make the playoffs..sorry Seattle) and obviously cares way more about money. And you know what, that’s okay. 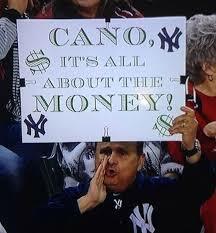 Yankee fans should not have booed Robinson Cano. Personally, I find it pretty classless and pathetic. First of all, the ignorant fans who say, “we don’t need him, and we are better off without him” are full of a word I’d rather not use today. Robinson Cano is one of the best 2nd basemen in the Major Leagues on both sides of the ball no matter what you think of his decision to leave the Yankees. Second of all, fans needs to wake up! I said it before and I’ll say it again: Robinson Cano chose the money above all else, and that’s okay! Robinson, if you somehow read this (wishful thinking I know), as a Yankees fan I want to say thank you very much for your tremendous contributions as a New York Yankee, and I wish you the best of luck in Seattle. Thank you for reading and leave a comment in the section below. Hey…there…buddy….hold your horses….as I recall…you berated the best NBA Player, King James for doing exactly the same thing Cano did and now you are defending Cano!?!?!?!?! ( To refresh your memory LeBron was treated like garbage for changing teams and making more money and your comments were very negative about his move.) Maybe your unbiased opinions are not so unbiased Mr. Yankee Fan of All Time!. So Cano was a nightmare player when he first started with the Yankees and made many, many errors on the field. Then he got it together and had hit after hit and great play after great play. While I am far from being a Yankee fan, Red runs through these veins – GO SAWKS!!! !, I am a baseball fan and players who demonstrate skill and character should be applauded. I agree that being a professional athlete regardless of what sport, is just that; a profession and like anyone else in this wonderful capitalist society we live in, the more $$$ someone can make the better…Right?! Correction….buddy….I did not berate Lebron James at any point when he left Cleveland to go to Miami. I simply said his legacy would take a slight hit because he needed to team up with 2 other very good players to finally win a title. Also, HE DID THE EXACT OPPOSITE OF WHAT CANO DID. HE LEFT AN UNPOPULAR, SMALL MARKET TEAM THAT WASN’T WINNING CHAMPIONSHIPS AND MOVED TO A BIGGER, MORE ATTRACTIVE MARKET IN ORDER TO HAVE A BETTER CHANCE OF WINNING A CHAMPIONSHIP. And he took a PAYCUT in order to team up with Dwyane Wade and Chris Bosh. Also, Cano did not make many, many errors in the field. His nonchalance was often confused with laziness or inability, which couldn’t be farther from the truth. Still unbiased here…good try though! Thanks for the comment as always and maybe you can invite the Red Sox over in October to watch the playoffs this years seeing as they won’t be in it. I humbly apologize oh prognosticator or prognosticators; seer of seers; knower or all these sports! I have been out of the loop sports-wise and misread what Cano did so of course I am feeling like a total idiot. Me aculpa! SO I will try to do better next time so please don’t yell at me! Thank you……. see you next time! Looking forward to more of your outstanding writing!! !